Illustrated by Florence Cestac, Kirsten Ulve, Shary Flenniken, Toni Pawlowsky, Mary Fleener, Annie Owens and Lesley Reppeteaux. THE MYSTERIOUS STRANGER was great tale, heretofore unread by me, in which Twain shows his insight into the human condition. Writes Twain: “Only man inflicts pain for the pleasure of inflicting it, inspired by that moral sense of his.” This tale would surely be controversial for some students as it questions the human understanding of God and religion, but it is important to study as many great thinkers have asked the same questions. Not all of the stories are controversial. As always, Twain has a snarky sense of humor and an uncanny ability to string words together. THE FACTS CONCERNING THE RECENT CARNIVAL OF CRIME IN CONNECTICUT was a fine example of his funny bone. A man, who happens to be illustrated to look like Twain, discovers that his conscience not only takes form, but can be destroyed. After that, the man is free to indulge his inner beast. His more famous story, THE CELEBRATED JUMPING FROG OF CALAVERAS COUNTY was another example of Twain’s wit and is kin to his novels, HUCK FINN and TOM SAWYER. While fine for sixth graders, Twain’s works are better suited for the high school student. Twain’s wit and wisdom is the perfect thing for the thinking and questioning classroom. Twain’s stories work on many levels, which allows for a diverse reading audience. There are heavy implications in his writing, yet the stories are not bound solely through the philosopher’s lens. This is, in my opinion, the best of the GRAPHIC CLASSICS yet. There are several other titles in the series including: Bram Stoker, Robert Louis Stevenson, O. Henry, Rafael Sabatini, Edgar Allen Poe, Arthur Conan Doyle, H.G. Wells, H. P. Lovecraft, Jack London, and Ambrose Bierce. Eureka Productions is releasing a series of tales for FREE COMIC BOOK DAY 08. It will showcase the works of Poe, Lord Dunsany, Conan Doyle, and Mary Shelley. Be sure to pick up the free volume and check out the series. You will want more. 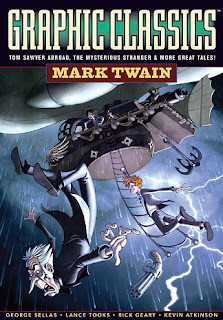 Twain is, in my opinion, the greatest American writer and his storytelling prowess is beautifully adapted with this series. What better piece of traditional literature to have in graphic novel format? If any piece of comic literature is suited for the high school literature class, this is it. COMICS FOR THE PRE-K CROWD?